The UK’s chief medical officers have released new advice on physical actitvity for pregnant women. Infographic on advice for pregnant women. 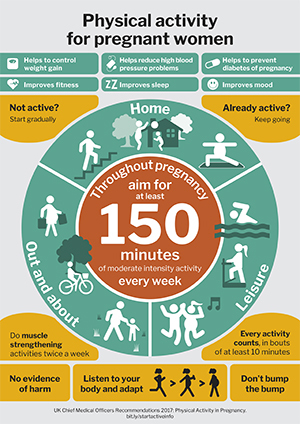 The UK’s chief medical officers (CMOs) have released new advice on physical exercise for pregnant women in the form of an infographic. It is aimed at providing midwives, nurses, GPs, obstetricians and gynaecologists, as well as the leisure sector, with the latest evidence on physical activity during pregnancy. The new recommendations aim to reduce issues such as obesity, diabetes and other health concerns during pregnancy. The new advice was compiled by the CMO expert committee for physical activity and pregnancy, which included midwives, obstetricians, exercise physiologists, GPs, public health consultants and sports medicine experts. The latest evidence suggests pregnant women should aim to do about 150 minutes of moderate intensity activity every week. The CMO information says the exercise will improve mood, sleep and fitness, and help to control weight gain. It will also help to reduce hypertensive disorders and prevent gestational diabetes. Women who have not been active before pregnancy are recommended to follow a gradual progression of exercise—beginning with 10-minute bouts of moderate intensity exercise, gradually building up to 150 minutes. The activity should be spread throughout the week. Women may need to adapt their activity throughout their pregnancy. For example, replacing contact sports with a non-contact sport or an appropriate exercise class, and not to ‘bump the bump’. The CMO information says information supporting the infographic showed no evidence of harm for mother or infant resulting from moderate intensity physical activity. Women who were not active before their pregnancy are advised to avoid intense exercise, such as running, jogging, racquet sports and strenuous strength training. Pregnant women are recommended to avoid activities where there is an increased risk of falling, trauma or high impact injuries, such as skiing and horse riding, and contact sports such as ice hockey. Women should seek medical advice if they experience breathlessness before or following minimal exertion, or headaches, dizziness, chest pain or muscle weakness affecting balance and calf pain or swelling. ‘The RCM very much welcomes this new advice from all four (CMOs) across the UK. The new advice in the form of an infographic is innovative and clear. ‘The RCM has consistently advised that being obese when pregnant can cause complications for women and their babies, and means we should do all we can to offer support and specialist maternity services for these women. ‘An increasing number of women are overweight or obese when they start having a family, and midwives do know they have a critical role to play in promoting public health and supporting weight management. This is why the RCM’s Stepping up to Public Health webpages highlight evidence-based information and tools for women and midwives to help them manage weight in pregnancy and after birth.